Grant, we pray, O Lord, that we may constantly exalt the merits of your Martyrs, whom Pope Saint Damasus so venerated and loved. Through our Lord Jesus Christ, your Son, who lives and reigns with you in the unity of the Holy Spirit, one God, for ever and ever. 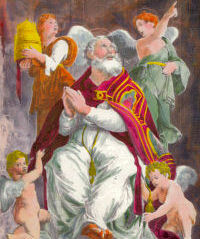 St. Damasus was Supreme Pontiff from 366 to 384. He was a very learned man, well versed in the Scriptures. He commissioned St. Jerome to complete the translation of the Bible into the Latin language. Shortly after his reign the 72 books of the Bible, hitherto scattered in different parts of the Orient, were collected into one volume. He defended the rights of the Holy See, and beautified the Roman resting places of the Christian dead and of the saints. He also confirmed the practice of singing the Psalms day and night in the churches and adding a Glory Be at the end of each Psalm. On Liberius' death, riots broke out over the election of a successor. The majority favored Damasus, who was born in Rome of Spanish descent. He had served as a deacon under Liberius and upheld the Nicene Creed. In less than a month, Damasus was installed in the Lateran palace. A minority, however, refused to accept the decision; they set up the antipope Ursinus. As the violence continued, Emperor Valentinian, who now ruled the West, was compelled to intercede and expel the antipope. Pope Damasus fostered the development of the Church during this period of peace by publishing a list of the books of both the Old and New Testaments. He also encouraged his longtime friend and secretary, St. Jerome, to translate the Bible into Latin. This Vulgate edition continues to serve the Church usefully. Damasus himself composed eloquent verse which he had inscribed on marble slabs and placed over the tombs of martyrs and popes alike. But Damasus is best known for his devoted project in the catacombs. He ardently searched for the tombs of martyrs which had been both blocked up and hidden during previous persecutions. He lighted the passages and stairwells of the catacombs, encouraging pilgrimages to the martyrs. He did much to beautify existing churches, such as building the baptistery in St. Peter's and laying down marble pavement in the basilica of St. Sebastian. Damasus was a vigorous defender of the orthodoxy, as well. He condemned the heresies of such men as Macedonius and Apollinaris and continued the march against Eastern Arians. Although Emperor Valentinian was a Catholic, his less capable brother Valens was under the Arian influence. Valens kept the Eastern bishops in turmoil until his death in 378 by the determined Goths. Emperor Theodosius, who succeeded Valens, supported the orthodox and convened the Second Ecumenical Council at Constantinople in 381. The council settled the dispute by recondemning Arianism and adopting the pope's teachings. Learn more about St. Damasus. Read about the Catacombs of St. Callistus where Pope St. Damasus wrote an inscription on the tomb of Pope St Cornelius. St. Damasus I commissioned St. Jerome to revise a translation of Scripture. Spend some time reading the Bible. See Celebrating the Feast of St. Damasus for ideas.